What happens when a small city invests in attracting the creative class? You have a city like Columbia, SC with a population of 117,000 adding 7000 new residences downtown within the span of a few years. – It has a major university, and is building a university research village (Innovista), not a university research park, that will create 8700 knowledge-economy jobs. – Developers are building appealing, human-scaled lofts and apartments, both contemporary and historic to appeal to different tastes and ages. In fact, while the research village provides for the younger population, the downtown is filling with boomers. – Of course there are changing market conditions that every city is experiencing, like the fact that less than 25% of all households consist of married couples with kids. However, the downtown amenities are so desirable that it may take a while before the supply catches up with the demand, as prices aren’t necessarily what you’d expect from a small Southern town. The units in the Adesso (pictured) start at $275,000! 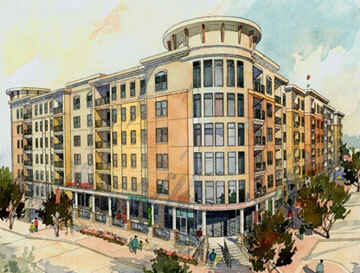 Most of the more attainably-priced homes are forthcoming in the 3000-residence university research village. So, developers, keep developing! Had to respond back about the comment that Greenville SC doesn’t have an theater that shows art films. I grew up there, now live in Louisville, and am amazed at the transformation of downtown Greenville. A virtual ghost town when I grew up there in the 70’s it is a vibrant, dense, exciting, beautiful downtown with an amazing urban park that wraps around and through the downtown, plus a cool minor league ball park. Everytime I am visit the action is downtown – and you could eat off the street – it is that clean. Years ago, you couldn’t give away land for free in downtown Columbia. Now, everywhere you go is a construction zone. I’m not talking about one part of the city. I’m talking about every part of our widespread city!